top tech communities (SEAP and PuneTech) and startup communities (POCC and TiEPune) came together to organize an event to let Pune’s startups mix with Pune’s established companies. 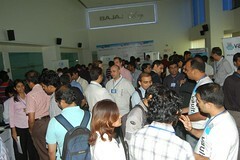 12 Pune technology startups were chosen from about 30 applicants to showcase their products at PuneConnect 2011. The 12 companies selected were: AdMogul, ApplyEzee, BizPorto, CoTrakr, Deja VU 3D, DroidCloud, InnovizeTech, IntouchId, kPoint, ReliScore, Vaultize, and World Without Me. Short write-ups of the 12 companies can be found here. All 12 companies got to demo their product to the who’s who of Pune. 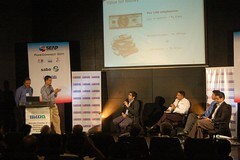 Senior members of SEAP, and Charter members of TiE Pune were asked to vote for their favorite demos and the top 4 companies get a chance to present at the bitter “Advantage Pune” conference being organized by Zinnov in Pune, in December 2011. Separately, 4 companies were selected to be part of the “Staring Up” show on ETNow, and their pitches were recorded to be televised nationally on ETNow on 15th November. These 4 companies were selected by the selection panel consisting of Gaurav Mehra, Suhas Kelkar, Moti Thadani of SEAP in consultation with Sudhir Syal of ETNow, and they got to pitch their startup to a panel consisting of Nickhil Jakatdar, Gaurag Mehra, and Suhas Kelkar on a program recorded by ETNow to be televised nationally later. In this program, InnovizeTech got the top marks from the judges and hence gets a direct entry to the final round of ETNow’s SuperAngels’ show where they get a chance to pitch for a million dollars of funding. The Starting Up now show recorded at PuneConnect will be telecast on Tuesday, 15th November at 11pm on the ETNow channel. It will be re-broadcast 9pm on Saturday, 19th November, and 10:30am and 7:30pm on Sunday, 20th November. It should also become available on YouTube and PuneTech will post a link to the YouTube video. The event was very well covered by local and national media. The Financial Express, the Financial Chronical, Business Standard, and the top Marathi newspapers Sakal and Maharashtra Times all carried detailed articles about PuneConnect. Three of the articles mentioned all 12 companies, and one of the articles mentioned ReliScore and InnovizeTech. Pune Mirror had a half page article on World Without Me as a direct result of being featured in PuneConnect 2011. Overall, we believe PuneConnect 2011 was a huge success, and we hope to do many more such cross-organizational initiatives in the future. The Software Exporters Association of Pune (SEAP) and the Pune Open Coffee Club (POCC) are inviting proposals from Pune startups and small companies for Pune Connect 2011, an event to be held on November 5th in Pune. In this event, the most interesting Pune startups and small companies will be selected to showcase their products and services to the world at large, and specifically to members of SEAP (which comprises some of Pune’s top IT companies). The idea behind this event is to allow the best startups in Pune a platform where they can find customers, mentors, business partners, affiliates amongst Pune’s established companies, and successful senior entrepreneurs. The best three start-ups from this event will be further showcased at Zinnov Consulting’s Conference in Pune on Nov 17th. SEAP will be lining up press coverage behind both events to make sure that the start-ups get maximum mileage. If you’re interested, and have a product that you can demo on November 5th, and if the target audience includes mature software/IT companies in Pune, please submit a deck of slides to puneconnect@punetech.com, on or before Monday, 24th October, 2011. Also, please mark the date & time of the actual event (5 November, Saturday, 10:30am-3pm) in your calendar.